Kevda Teej, also known as Kewda Trij, is a Hindu ritual observed mainly in Gujarat on the third day of the Shukla Paksha (waxing phase of moon) of Bhadarvo in Gujarat. In 2019, the date of Kevda Teej is September 1. This observance is quite similar to the Hartalika Teej Vrat. Married and unmarried women observe a fast on the day and offer Kewda flower to Goddess Parvati and Lord Shiva. Married women observe the Kevda Trij Vrata for a prosperous and happy married life and for the well-being of their husbands. Unmarried women observe it for getting a good husband. 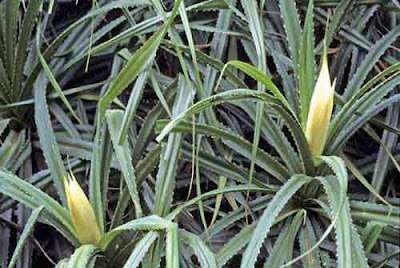 Flowers of Kevda (Agave) are offered to Lord Shiva and Goddess Parvati on the day. Women also offer special prayers in Lord Shiva Temples. Some people opt for complete fast others observe a partial fast on the day. The flower is known Kewda (Hindi), Thazham Poo (Tamil), Ketaki / Dhuli Pushpam (Sanskrit). It must be noted here that Kewda flower was cursed by Shiva and is only used in Shiva puja on very rare occasions. The fragrant flowers of Kewada are used in making aromatic oils and perfumes. The flowers are also used to flavor food. The tender leaves of Kevada are eaten raw or cooked. The dry leaves are used for making mats, baskets and other fancy items. The oil and the fragrant distillation of the plant is used in headache and rheumatism. The roots are used as anti-septic and the juice obtained from the roots is used to cure wounds, ulcer, fever and leprosy.